DBI Design, invite you to join us for an intimate and informative presentation from three of the Gold Coast’s leading industry experts, who will provide their insight on development opportunities, expected town planning & market challenges, demographic research, major projects, and key factors shaping the direction of the city. With predictions of the local population doubling by 2020, large-scale innovative developments, and the expected impact of the upcoming Commonwealth Games in 2018, the Gold Coast is undeniably set for historic growth and changes ahead. This is a rare opportunity to gain an insight from Gold Coast's elite minds on what we can expect for the future. To purchase tickets for this event, please register here. 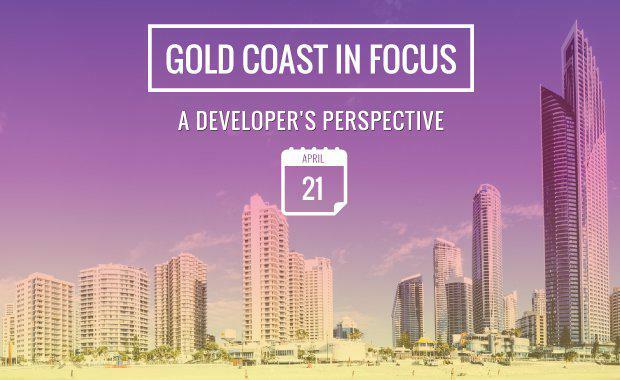 To be held at the QT Gold Coast hotel on 21 April, the presentations are an essential resource for developers and professionals alike. The current trends and key factors shaping the Gold Coast. Town planning challenges and opportunities. What’s happening in the market with buyer and sales demand. What changes to existing planning and zoning classifications can be expected since the recent council election results. What impact will the 2018 Commonwealth Games have on shaping the future of the Gold Coast. Chris brings 15 years of experience in the development industry to his role as Director and the National Planning Leader of Place Design Group, a Brisbane-based international planning and design firm. Chris has worked extensively on projects throughout Australia and overseas in China, East Asia, the Pacific and the Middle East. PDG's presence on the Gold Coast is growing rapidly with involvement in projects including; Aria, The Oracle, Nirvana By The Sea, The Surfers Paradise Foreshore and Circle on Cavill. With a specialty in DA negotiation, community consultation and strategic planning, Chris works closely with developer clients to advise on what’s happening both within Brisbane City Council and within the broader town planning environment. Chris is currently Vice-President of UDIA Queensland and was recently awarded the Queensland and Australian Planner of the Year Award by the Planning Institute of Australia in 2014. Raith Anderson / DBI Design - Raith is a Registered Architect with Degrees in Built Environment and Architecture and a Diploma in Project Management from Queensland University of Technology. Raith has been part of the DBI team for over ten years. With a strong focus on project delivery, Raith’s involvement in projects covers the broad spectrum from initiation through to hand over. Raith has successfully completed large scaled developments both nationally and internationally ranging from high-rise residential, five star resorts, master planned communities, shopping centres, and integrated golfing retirement developments. Projects that he has been affiliated with include ‘The Wave’, a silver medal winner in the prestigious 2006 Emporis Skyscraper Awards. As Managing Director of DBI, Raith is keen to ensure that the reputation for excellence that DBI has developed over the past 34 years continues into the future. With more potential award winning developments currently under construction that trend looks set to continue. James has recently joined the Knight Frank team as Director, Commercial Sales within the Gold Coast office. James has extensive experience dealing with major asset sales and also as a Project Partner and Development Manager of a range of differing forms of property development projects. Formerly, as a Joint Managing Director of the Special Projects Division at PRD (now Colliers) on the Gold Coast, James was responsible for many of the largest asset sales and development site amalgamations throughout the 10 years in this role. In more recent years, James has been a Project Partner and Development Manager in a range of development projects. In his time on the Coast, James has been involved in sales ranging from the Q1 supertower, to the Palazzo Versace hotel and Casuarina Beach estate. He also worked the other side of the fence as a developer, notching up several prominent residential and commercial projects, including the Nexus Towers, the first highrise residential tower in Southport. Setting a new standard of designer Surfers Paradise accommodation. QT Gold Coast hotel is deliberately intended to inspire conversation and arrest the senses. Guests to our Gold Coast accommodation can indulge in the vibrant beachside location and the unique Gold Coast spirit. For guests and locals alike, QT Gold Coast is an entertainment destination. The Baja California cool of Stingray Lounge has become the premier hangout of Gold Coast’s ‘it’ crowd. The unique marketplace style dining at Bazaar is reason enough for many guests to return.